Height 4 – 6 ft Spread 6 – 8 ft. Habit: Dense bushy evergreen that is shrubby when young but becomes more treelike with age. 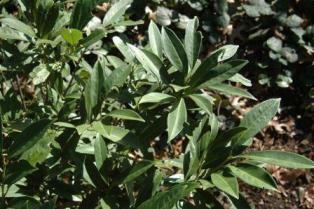 Has long glossy leaves 4 – 6” in length, 1” wide dark cup shaped that are green above, and pale green underneath. Fragrant white flowers white flower spikes in late spring in mid and late spring followed by ½’ fruit, red at first ripening to black. Notes: Mine has not flowered yet – probably because it’s in too much shade. I plan to move to full sun. Culture: There are many cultivars of this little used plant and some are low growing The upright forms can reach 25’. Kin and similar to the common Carolina cherry laurel P. Caroliniana but has thicker, more leathery leaves.